I know it’s late to be posting our simple plans for the Feast day, but I thought I’d list them nonetheless because these ideas are simple and would be easy to follow in your own home. Today, on the Church calendar, we remember one of the greatest events in all history – the Incarnation of Our Lord! Our redemption and salvation began with the humble Fiat – Yes – of Our Lady as the Angel Gabriel came to her announcing the great work she was to take part in. Set it to play as you work through the day – it’s beautiful! thinking and meditating on each of the words. Make little fiats throughout the day in our little actions – each one a mini “yes” to God’s request in doing our daily duties. Be sure to visit Catholic Cuisine for fantastic ideas for today’s Feast of the Annunciation! There are some really easy ideas in there! Since I’ve had sick kiddos, my “feasting” is going to be pretty simple! We’ll do chocolate chip cookies with white whipped cream on top – white for Our Lady’s purity and her sweet “Yes”! Can you identify the words the saintly painter shows coming out of the Angel Gabriel’s mouth? Can you spot the Holy Spirit? Who is that walking on the hill in the background of the painting? Outside the fenced wall of the garden? St. Michael escorting – by sword – Adam and Eve out of the Garden of Eden. Note that their setting is barren, while Our Lady is in a fertile, blooming garden. Do you see the little fence around the garden – there on the left side of the painting? Read about Our Lady, sometimes referred to as A Garden Enclosed. May you all have a blessed Feast Day, celebrating the sweet Fiat of Our Lady and the great Incarnation of Our Lord! I’m glad you posted this, Jen. 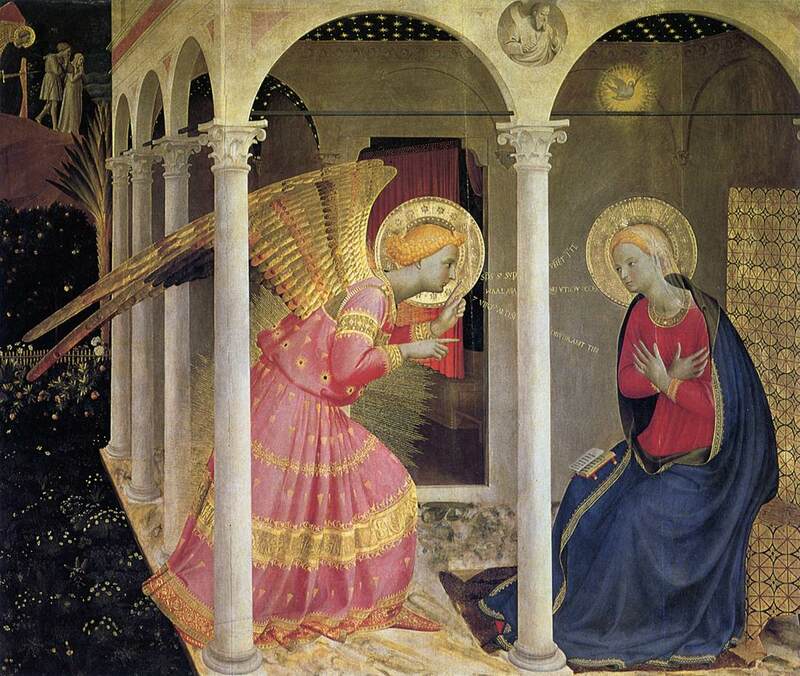 My children and I enjoyed looking at Fra Angelico’s painting and listening to the Magnificat. We had studied a different Annunciation by Fra Angelico a year or so ago, and it was neat to see the kids recognize his style and the painting, and for them to realize that this one wasn’t quite the same as the one we studied before. And The Magnificat – how beautiful! I have a CD with that piece on it, but it was amazing to see the choir and musicians performing the work. It really gives you a sense of the complexity of the piece. What a joy it must be to be able to join with others to create something so beautiful!